So, you’re in the market for an affordable leg press machine? We’re guessing that you want to develop strong and well-defined legs that look great in a pair of shorts, and you want to do it in the comfort and convenience of your home. Who doesn’t want that!? Building strength and muscle in your lower body doesn’t just make you look and feel great, it also makes you healthier. Medical research has consistently demonstrated a strong direct link between muscular strength and general health. In fact, a recent meta-analysis* that examined data from approximately 2,000,000 people found that having strong legs is associated with a lower risk of death (for any reason) in the adult population. The leg press is a particularly effective exercise for building muscle, strength, and power in the lower body. It’s routinely used in sport science research on muscular adaptations in the legs for this very reason (see this study for example). All of this information tells you that picking up a leg press machine for your home gym is a very worthwhile investment. But knowing which one is the best for you isn’t easy. And that’s where we come in. In this article we take a good look at the most affordable leg press machines you can pick up for your home gym that will deliver the best results. You have two main options in affordable leg press machines: Vertical leg presses, and horizontal leg presses. The difference obviously lies in the position of your body as you press the weight. Vertical leg presses are performed lying on your back on a slightly angled back pad (often around 7 degrees), and pressing a platform loaded with weight plates directly above you. The footprint of the machine is smaller, and there are fewer components. As such, vertical leg presses tend to cost less, and fit into smaller spaces than horizontal presses. Because you’re pushing the weight plates entirely against gravity, you need fewer plates than horizontal variations. This makes vertical leg presses significantly more economical. One of the main criticisms of the vertical leg press is that they can place a lot of strain through your lower back. This, however, will usually come down to the quality of the machine, and your form. A good machine used with good form shouldn’t be cause back pain. Good form on a vertical leg press means never allowing your back to leave the back pad – it should always be flat against the pad, and never rounded or raised. While vertical leg press machines may look daunting, owing to the fact that significant weight is sitting directly above your head and torso, they aren’t inherently more dangerous than horizontal leg press machines. If used correctly, both are safe. If used incorrectly, both are unsafe. If you have a smaller home gym and are having a tough time finding a leg press to fit, the Powerline has a small enough footprint that it shouldn’t be an issue. Made of sturdy alloy steel, the frame features a powder-coated finish. This design is made to withstand the strain your workouts are sure to put on it, and prevent any rusting or scratching from occurring. 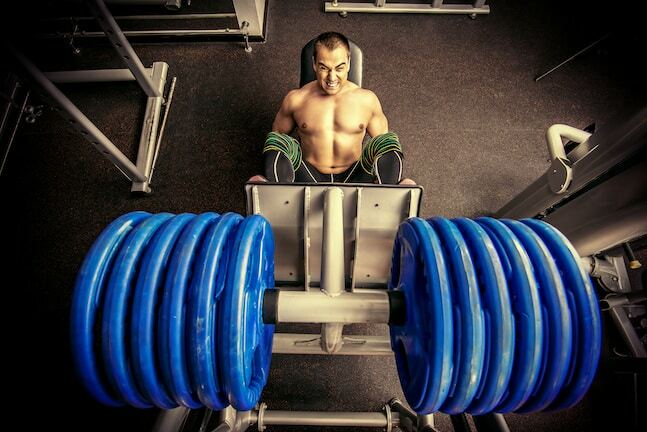 As you’ll have a lot of weight over you, an extra-thick back pad is essential in vertical leg press machine machine. The contoured neck and head pad will make sure that you’re lying in a safe and comfortable position. It’s also important to note that this machine does tend to squeak and make a bit of noise when in use, so if you’re in a share house, apartment, or somewhere that requires peace and quiet, you may have to carefully choose the times at which you use it. The TDS Premier Vertical Leg Press is a solid option that features a strong frame, and while it’s relatively basic, it certainly does what it’s supposed to do. The simple design makes it great if you’re sick of overcomplicated workout equipment that seems to be more gimmicky than effective. The silver grey frame is mounted on 8 heavy duty rollers, featuring an extra-wide deck foot plate for your comfort and versatility. While the stoppers do take a while to set up, the industrial quality makes for smoother and more secure operation. The frame can handle up to an impressive 1,000 pounds, which is over twice what others in this price range can do. With that extra weight, comes extra danger, which is why the strong safety stoppers are much appreciated. The frame’s length will accomodate just about any user’s height, and as the carriage can come down all the way to the back pad, your lower body will benefit from a full range of motion. Speaking of the back pad, the 3-inch padding makes it easy and comfortable to use. The only downside to this, is that it doesn’t come with a separate neck rest which may make it a bit odd-feeling. In fact, if you don’t purchase or use a separate pillow for your head, it can put your spine in a slightly unnatural position. 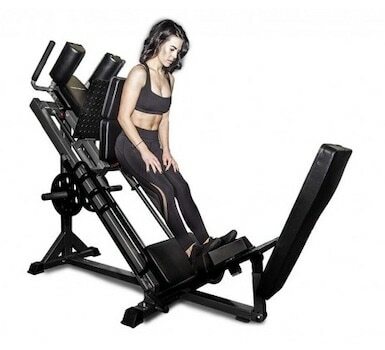 The flipside to this is that you can easily reverse your body position in this machine, which allows you to change your footing and angle of push so as to target different muscles effectively. While seated leg press machines have their place, a good vertical press can work wonders on your hamstrings, glutes, calves, and quads. The Valor Fitness CC-10 is an exemplary product in this category, made of 2 x 2″ solid steel that is the perfect addition to any home/garage gym. The 500-pound capacity isn’t the heaviest, but most people aren’t going to max out at 1,000 pounds anyway. The solid steel, hammertone footplate is of high quality, but we would’ve liked to have seen it a bit larger for greater variation in foot positioning. However, the back pad is one of the best available. The high-density, dual-layered vinyl padding is extremely durable and comfortable. The ergonomic design is made to flow with the natural curve of your spine, and the neck pad provides great support and keeps you in a comfortable, natural position. What’s more, it’s boasts one of the largest body pads you’ll find, measuring 33.5 x 17.5″ and the neck pad measuring 10 x 7.5″. To load weight plates, you have three storage pegs to evenly distribute the weight to let you lift heavier. 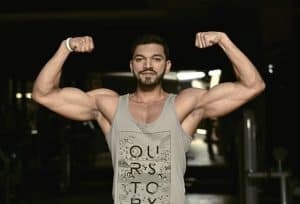 Bearing more weight means more strength and mass gains, so if that’s what you’re looking for this may be the best choice. The pegs are compatible with both standard and Olympic plates, and while you do receive 3 Olympic sleeve adapters, the machine doesn’t come with weights. 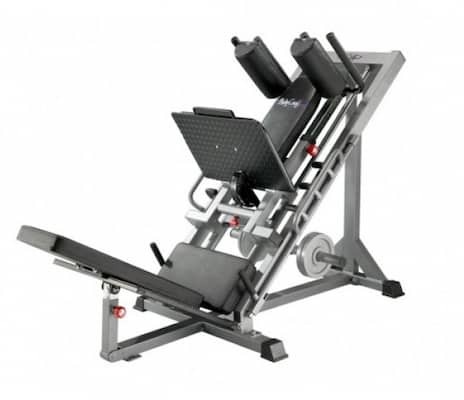 If you have a smaller space for your home gym, then the narrow design and relative light weight of the CC-10 is ideal. 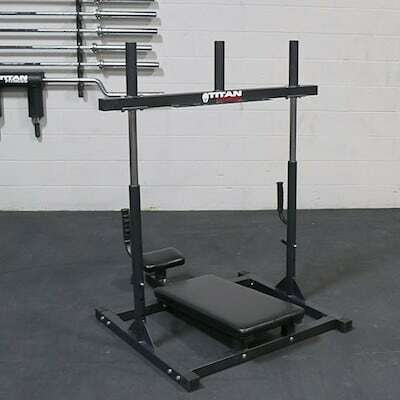 Titan is one of our favorite exercise equipment manufacturers, due to the fact that they produce good-quality, straightforward machines at an affordable price. Their Vertical Leg Press is the perfect example of this. For a few hundred bucks, you’ll be getting a sturdy machine that helps you absolutely wreck your legs (in the best way possible). Like all vertical leg press machines, the Titan press provides an excellent alternative to regular squats by taking the stress off of your back and shoulders, and allowing you to focus only on the areas you want to train. Three weight posts allow for easy loading / unloading while also ensuring weight is spread out evenly. In our opinion, the adjustable footplate could definitely be larger, but it’s easily adjustable to suit different heights. The weight capacity on this machine is 400 lbs, which is one of the lighter limits, but if you use the press in conjunction with hack squats, jump squats, or other lower body strength-based exercises, you’re unlikely to require more than that. While the back and neck pads aren’t quite as thick or contoured as some of its competitors, and they are sufficient for keeping your spine in a neutral and low-risk position. The neck pad is also one of the biggest you’ll find in terms of area. So, if you’ve got a big melon or mop of hair, you’ll likely appreciate this feature. If you’re planning on having to move the machine around in your garage, or whatever your situation is, the fact that it’s only 94 pounds really makes things easier. 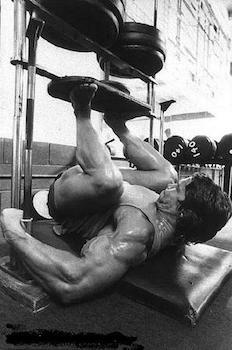 Horizontal leg presses are what you commonly see in commercial gyms. Your body position is a seated one in which you’re either completely upright or, more often, on a 45 degree angle (hence why their also known as seated leg presses). Horizontal presses use a wide range of mechanisms to produce resistance. 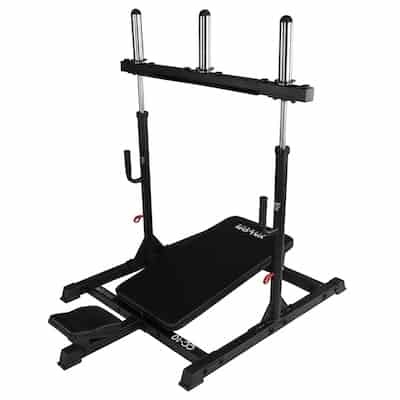 Many use a plate-loaded platform on guide rods, similar to vertical leg press machines. Others use hinge, or pneumatic mechanisms, while some (like our top pick) use a cable and pulley setup. Horizontal leg presses generally have significantly larger footprints than vertical leg presses, and therefore require a lot more space in your home gym. In addition to the greater space taken up by the machine itself, they also usually need a bit of clearance on the sides to allow you to load up the weight plates, which further increases their functional area. 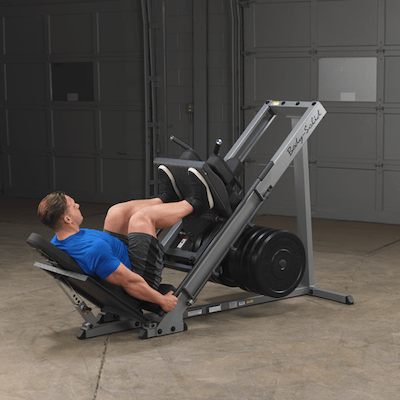 Because they’re bigger and often more complex, and therefore have more components, horizontal leg presses also tend to be significantly more expensive than their vertical counterparts. This is compounded by the fact that they require more weight plates to do the same amount of work as a vertical machine. When you load 200lbs on a vertical leg press, you’re pressing 100% of that weight. Not so on horizontal machines. Their design removes some of the resistance created by gravity, and means that if you load it up with 200lbs, you’re really only pressing about 60 – 70% of that weight. Yes, horizontal leg press machines may seem to have more downside compared to vertical machines, but they also have plenty of upside too. These larger machines have larger bases, and tend to be significantly more stable than vertical presses. This is important because it means they are usually smoother and quieter in their operation. The seated position tends to place less strain on the lower back than vertical presses as it’s more difficult to push your back off the padding or round your spine. It’s also inherently more comfortable being in a seated position than lying on your back with a couple hundred lbs pressing down on you. This often ends up being the biggest drawcard of the horizontal leg press machine; if you’re comfortable while using the machine, you’re more likely to use it consistently and gain the benefits it offers. You may only spend a couple hundred bucks on a vertical leg press, but if you never use it, then that’s still money wasted. With that extensive info out of the way, check out our top 3 picks for affordable horizontal leg press machines that’ll help you get maximum results in the comfort of your home gym. 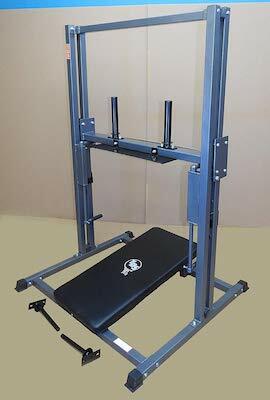 We’re back again with another TDS product; this time with their Horizontal Leg Press. While it doesn’t isolate the lower body quite as well as vertical presses, you can still put quite the load on this model. Despite looking a bit flimsy, it’s surprisingly durable, with its 4,000-pound tested cable able to handle any realistic load you put on it. The good thing about this is obviously that you won’t ever have a limit to how much weight you can lift, unlike with many others. The carriage and rollers are both made to handle extremely heavy weight loads, so count on this one lasting you for years. Being able to hold both standard and Olympic weight plates (neither is included), you don’t really need any kind of adapters which makes it all the more convenient. Steel deck plates hold up to the quality of the rest of the machine, while being placed for ideal form to reduce the risk of injury. The seat is made of deluxe padding, covering both the back and bottom of the chair so you can take on as much weight as you’d like without the frame digging into you. While the frame can support up to a 6’4″ user height, the seat should probably be a bit taller to accommodate those on the higher end of this spectrum. The only other “con” we could see, was that it has a pretty long footprint, which can be difficult if you have a small home gym layout. 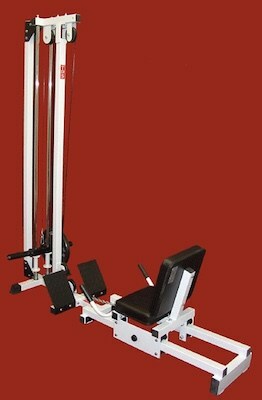 This horizontal leg press takes our top spot because it’s well-priced, and is easily the safest option available. Yes, it takes up a lot of room, but there is zero chance of being crushed while using it. While the Body-Solid Leg Press and Hack Squat Machine does take up a good amount of space, we can definitely say it’s worth it. This is one of the most budget-friendly machines on the market today, due to the fact that it is effective, high-quality, and actually includes weight plates (unlike the others on our list). We all want to get the most out of our workouts with as little fussing around as possible, right? With this machine, you have the ability to use it like your standard leg press, as well as reverse your body to perform hack squats. The leg press does a great job at hitting the quads, but as your body is bent 90 degrees, you don’t get that full hip extension. That means you won’t be able to hit the upper hamstrings and glutes as well. However, with the hack squat, you’re placing your main focus on both of these areas so no part of your lower body goes untrained. The diamond plate foot platform is nice and large, which means that you can switch up your stance with ease. The heavy-duty 2 x 4″ 11-gauge steel mainframe minimizes torsional flex which means it can definitely handle whatever you throw at it. The roller system slides back and forth with ease, and does so without much sound. The back and shoulder pads on this model are some of the most luxurious we’ve seen, with 4″ padding. The pad is contoured to support your lower back and shoulders, as well as your head (depending on your height). Along with the last product, we have to say that the Bodycraft F660 Leg Press/Hip Sled is one of the most innovative products out there. Adjustable shoulder pads allow anyone, of just about any height, to use it with ease through their full range of motion, and the foot plate moves at just about any angle to target any and all muscles in the legs and glutes. 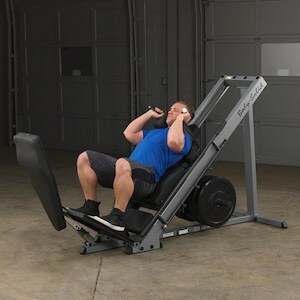 Thanks to the fact that the foot plate can move out of the way, you can easily perform hack squats or donkey calf raises, making this a unique machine that can produce a safe and effective complete lower-body training session. With a weight capacity of a whopping 1,000 pounds, safety is a major factor. If you’ve dealt with lower back pain with doing your leg presses or squats, you’ll love the F660. It works to keep weight against your lower lumbar, which can get eliminate spinal compression while protecting your lower back throughout the entire exercise. If you’ve ever had a machine with plastic wheels, you know that they become flat after so long. This model comes with industrial-grade linear bearings instead, which never flatten or wear out. In fact, the entire machine comes with a generous lifetime warranty. We can’t say it’s the cheapest product out there, but if it’s going to last you decades, you may just end up saving money. Never lock out your knees; this is asking for an horrific knee injury, especially if you’re pressing close to your limits. Always keep a little bit of bend in your knees, even if you’re resting at the end of a rep. Locking out at the end of a rep puts you at danger of hyperextending your knees. If this happens on a heavy press, you may do serious permanent damage. Always ensure you’re using good form on every rep. Your knees should track over your toes, and you should be taking care to prevent your ankles from rolling inwards or outwards. If your form is starting to suffer on your last few reps, you’re doing too much. 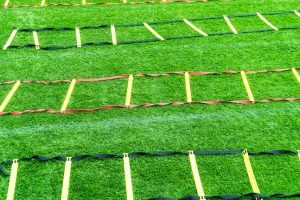 Not everyone is built the same, and the positioning that produces good form for someone else will not necessarily be the same for you. Always start with an empty press to find the best and most comfortable position for you that produces the best form. Complete every rep in a smooth controlled fashion. 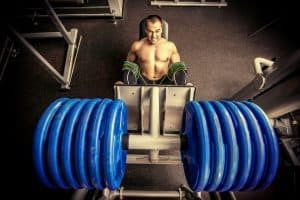 There is very little benefit in doing explosive reps on a leg press, and what little there is to be gained from doing it is vastly outweighed by the danger. Keep your lower back firmly against the backrest. Your back will tend to lift off the backrest when you bring your knees too far toward your chest in the eccentric portion of each rep. This places significant and unnecessary stress on your back, particularly the lumbar vertebrae, and risks an injury. Find the point at which your back starts to lift off with no weight on the press so that you know what to avoid when the press is loaded up. Vary your foot positioning on the platform / footplate. Placing your feet in different positions places the emphasis on different muscles and allows you to target muscles in different ways. A wider foot position will place more emphasis on the inner quads / groin, while a more narrow foot position will place greater emphasis on the outer quads. Pushing with the balls of your feet will work your calves more intensely, while pushing more with your heels will work your hamstrings more intensely. However, not all leg presses will be built in a way that allows for safe variation of your foot position, and if this is the case it’s definitely better to be safe than sorry. Rest assured that no matter how you position your feet, your quads, calves, hamstrings and glutes will all get a good workout. Well, there you have it: The Best Affordable Leg Press Machines for your Home Gym. Pick up any of the above recommendations and you’ll be well on your way to consistently excellent leg workouts in the comfort of your own home. The leg press often gets a bad wrap. It’s considered by many to be inferior to squats and other free weight exercises, and therefore not worth doing. We believe this to be an uninformed and close-minded point of view. It isolates the quads, glutes, and hamstrings extremely well, and has proven to be highly effective at building muscle and strength in the lower body. Like all exercises, the leg press has its drawbacks. It’s wise to combine it with a range of other leg exercises, including squats and others that utilize a barbell, in order to get the best results. Ultimately, if you make sure you’re using your leg press safely and effectively, and we’re certain you’ll reap significant gains.